Ed Valentine | The Coolest Thing I’ve EVER seen! The Coolest Thing I’ve EVER seen! 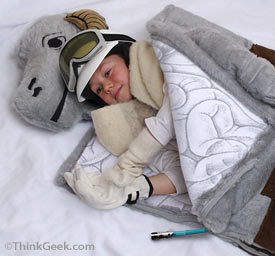 Check out this homage to “Empire Strikes Back” – the Tauntaun sleeping bag. Complete with a lining designed to look like GUTS. Oh, man oh man. How cool is THAT? Ok, ok: so it’s an April Fool’s Day hoax and it’s not really for sale…. YET. Apparently the folks at the website had so many people attempting to buy the fake Tauntaun that the bloggers are now trying to get it licensed by Lucasfilm. 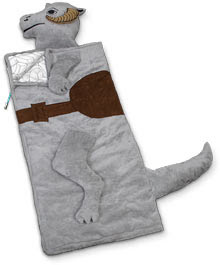 So I still have hopes of sleeping cuddled up in a dead Tauntaun someday. Email ThinkGeek and tell them you want one, too. This entry was posted in Uncategorized. Share link: http://www.edvalentine.com/the-coolest-thing-ive-ever-seen/. Follow comments with the RSS feed. Post a comment or leave a trackback: Trackback URL.